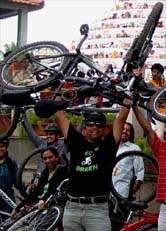 GoGreen Campaign Ride towards Sakalavara Village. 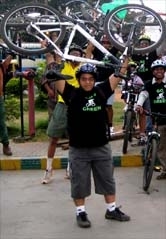 10 April 2011 - GGI-Group size: 4000+ Professionals, Increasing on day to day basis, Come & join us 2 serve Mother Nature. 18GGI's set out to Sakalavara Village which is off the Bannerghata Road and around 10km's from Jaynagar 5th Blk. Started the ride by 6:45am against 6:30am. most of them started joining on the way hence need to wait all along. 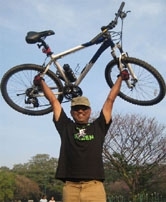 finally reached the village by 8:00am where Mr. Vijay Kumar's from Rotary had organised a Cyclothon @ his Farm for Rotary members, starting from his farm. Mr M.N Suresh (Retd. District Governor) was there to flag of the event.